A new Chinese car company #Techrules is claiming to be able to produce an electric super-car recharged by a micro gas turbine engine. It’s known as a Turbine Recharged Electric Vehicle or #TREV. 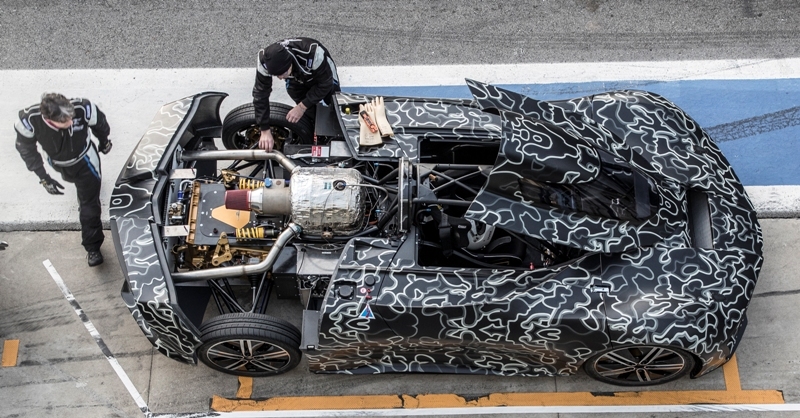 A car with a super high performance chassis, breaks, suspension, powerful electric motors, a high capacity battery and a gas turbine generator to recharge it and to extend the range. All these integrated together and bristling with high-tech gadgetry. Imagine the sense of occasion and spectacle, a car like no other, a car with it’s very DNA in common with a jet-fighter! The driver is treated to the sense tingling audible whine of fast turning sculptured blades, beautiful forms fashioned from exotic metals such as Titanium and Nimonic, only for function over form, elegant to behold yet hidden from view in the power-plant’s belly. The gas turbine is surely the coolest of prime movers, something unique, something to make the super car truly original, technically innovative and un-matched by even it’s closet reciprocating rivals. Does this signal the end of the piston engine automotive dominance? Only one production car model has been sold the World over that burns hydrocarbon fuels but does not use a piston engine - the Mazda RX but it’s not really that different, but now at last something that is different, not since the 1960s have gas turbines been seen in cars (Crysler Turbine Car), one even completed LeMans 24 hour race (Rover BRM) and now with the help of electric motors and batteries one is back. And it’s called the #Techrules #REN, and not just another concept car, Techrules say they will be taking orders at the 2017 Geneva motor show and begin production in 2018, it seems we don’t have long to wait. The turbine car is HERE! Or is it? Put it under close scrutiny and take away the hype and spin the immediate prospects for the existence of TREV car are not quite a hopeful as the marketing people would have you believe! Building such as car is a pretty tall order, yes state of the art motors, batteries and electric vehicle (EV) components exist but when it comes to the micro gas turbine (#microturbine) things start to get a little tricky. Building a microturbine is a big deal and using gas turbines of any kind in automotive applications is a big deal too. Mass producing a durable, efficient micro gas turbine for use as a range extender is a big technical challenge with many engineering obstacles! (see Page: Microturbines and Micro Gas Turbines ) Integrating a gas turbine in to a practical vehicle also presents many challenges. The history of the gas turbine car so far has been a chequored one, beginning in the 1950’s the car companies Rover and Chrysler experimented with turbine power plants directly driving the wheels. They were almost successful and may have been close to limited production, but difficulties in producing recuperator matrixes (essential for sensible fuel consumption) and the fuel crisis killed them off. Actually automotive gas turbine development didn’t stop there, research went on and companies such as Toyota and Volvo kept on trying. Chrysler came back to it with the Patriot sports car. And small gas turbine development didn’t stop either- Honeywell, Elliot, Turbogenset and Bowman Power Systems developed small lightweight and powerful microturbines but they only ever made it in to limited production. And now all these companies have ceased or withdrawn from the microturbine market. In the World today only one true micro gas turbine manufacture exists with units in volume production; Capstone Turbine. 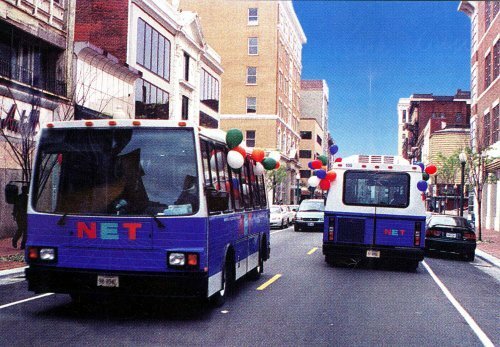 Capstone was founded by a couple of ex-Garrett engineers in the 1990s. They set about designing a high efficiency recuperated micro gas turbine for fitment to a vehicle. What emerged was the Capstone C30 30Kw unit and they began selling them in the early 2000s. At some point they must have explored the combined heat and power market because their focus shifted to stationary units. Capstone now sells a three unit range of stationary microturbines from 30kw to 200kw able to be fuelled on natural gas. The 30kw unit has now been around for some 15 years, it’s design seemingly unchanged. Capstone produce what is called the Hybrid Electric Vehicle model (HEV) that is able to run on liquid fuels such as kerosene or diesel. The HEV unit produces DC current suitable for charging batteries, the stationary CHP type units produce AC current suitable for connection to the power grid. 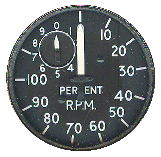 It is a remarkable piece of turbo-machinery machinery and it must of been quite a headache to develop. It’s actually mechanically very simple, an essential feature in order to keep manufacturing costs to a sensible level. The single moving part rotor is built almost as one piece. I’m sure much cost saving innovation went it to it’s design at the hands of very experienced engineers. So over the last decade a number of attempts have been made to integrate the Capstone C30 in to various vehicles. To date it is the only suitable production micro gas turbine that is able to be adapted for vehicle use. So it’s no surprise when niche vehicle and technology companies claim to be attempting to use it. 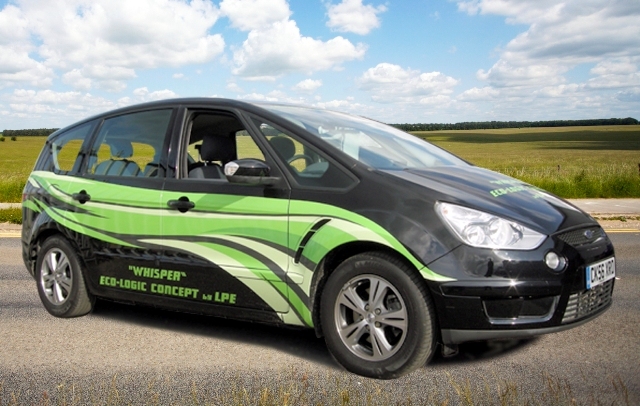 The Eco-Logic family people carrier. Not a high performance sports car but a standard road vehicle. Presumably sponsored by Ford the Eco-Logic was built by a motor-sport company in the UK Langford Performance Engineering LPE. It was built around 10 years ago, not much technical details are available but it will have been a squeeze fitting the microturbine (understood to be mounted under the hood), electronics, batteries and traction system. An amazing vehicle but in 10 years nothing has appeared since, an unsuccessful technology demonstrator? 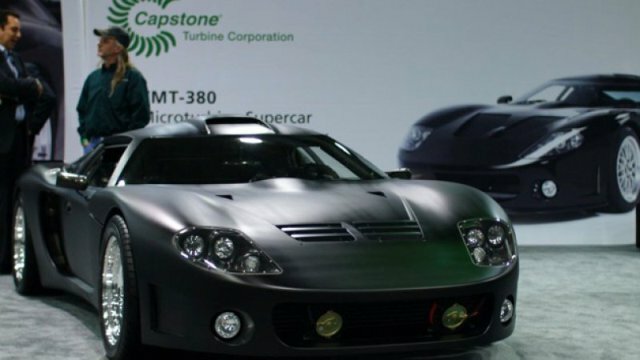 Sponsored by Capstone themselves the CMT380 super car. Built a view years ago now, an electric sports coupe. A tightly integrated installation but one with vulnerabilities, the Power Controller Electronics (DPC) are mounted right at the rear. In wet weather the delicate electronics (identical to the stationary CHP model) could be exposed water with catastrophic results. Inside the DPC voltages as high as 700V DC exist! Another technology demonstrator so why hasn’t it caught on? Do they sell them? Motor-sport carbon fibre control panel identical to CHP units! Municipal bus public transport service. 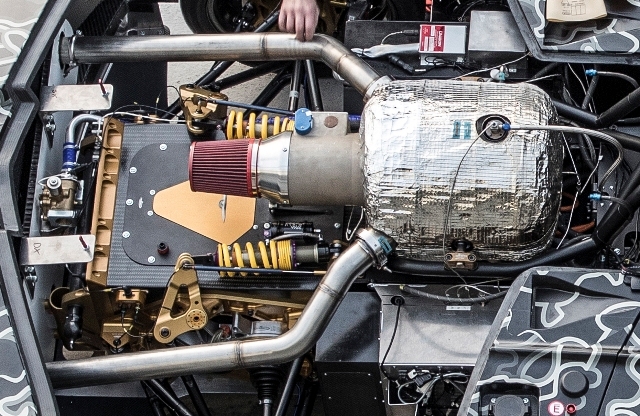 The C30 microturbine could be described as the world’s cleanest burning diesel engine. A diesel engine without the fumes! It is possible to sniff the exhaust gases, it doesn’t even smell of diesel. For this reason in congested city centres micro turbine propelled public transport is a great way to improve air quality (something London is struggling with due to the multitude of diesel powered cars and buses). A company Advanced Vehicle Systems AVS was contracted to build hybrid electric buses. Using the C30 microturbine as a re-charger and lead acid batteries. Probably the first attempt at a bus project, AVS ultimately failed due to reliability problems but the actual C30 unit survives to this day with just some rain induced surface corrosion! Around 2010 a super-car company Velozzi claimed they intended to build turbine recharged electric vehicles (TREVs). In a Capstone press-release it was suggested they would use the Capstone C30 and C65 units in different models. Today they now advertise a V10- or V12 piston engine, what happened to those turbine aspirations? Another attempt at a hybrid bus from Design Line Buses. 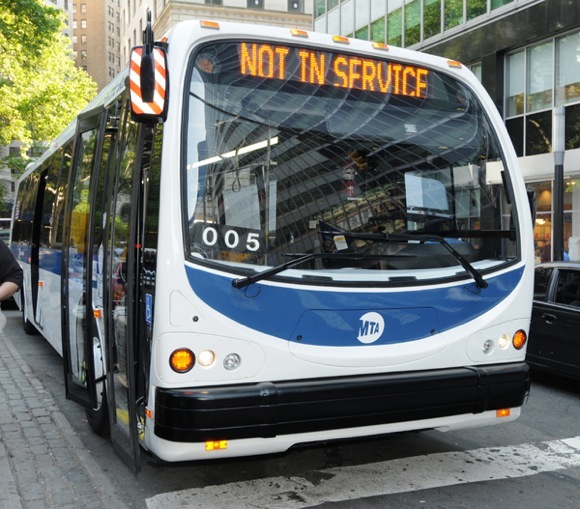 A New Zealand based company produced buses for use in New York. A number of configurations were tried but ultimately they lacked the robustness and durability for the rigours of public transport life and they were removed from service. A real shame - just what London needs! Wright Speed a US company has built a turbine powered garbage truck. Short start-stop urban type collection and deliveries are potentially suited to electric vehicles. A truck has been demonstrated that uses a Capstone C30 microturbine to recharge batteries. Claims are made for the efficiency and cost of ownership that compare favourable with diesel powered trucks combined also with the low emission benefits of a microturbine. Wright Speed manufacture electric transmissions, they also appear to be developing their own microturbine the Fulcrum turbine. A sophisticated unit with two stage compressor, axial flow turbines and a recuperator but it looks complex and therefore expensive to manufacture. And it will have to be proven in service. Service life and manufacturing costs are two significant obstacles to be overcome when building microturbines. 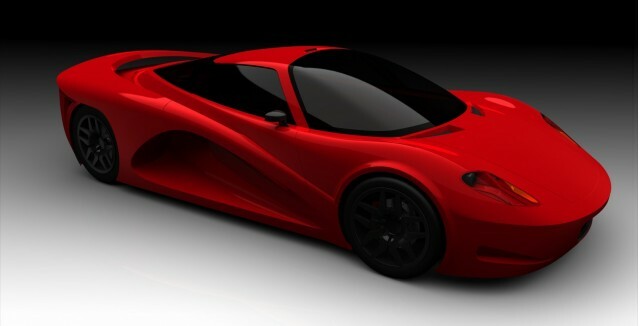 And Now Techrules- A Chinese company Techrules are claiming to be developing a TREV super car called the REN. Like all the other ventures Techrules actually have no choice but to use a Capstone C30 microturbine initially at least. There is no other suitable power plant available, the alternative is to develop your own and it will take years to do this! First shown at the Geneva motorshow in 2016 the car will have over 1000hp available from motors and batteries, technology all proven in many other “hyper cars” . But as a continuous source of power only 30Kw is available, so we might see one or two of these cars in the slow lane of the freeway? It could take 20kw to cruise at 80 MPH and just 10kw left to recharge those batteries. You can’t cheat the laws of physics the energy has to come from somewhere! Techrules claim they are working in partnership with China Aerospace and they will be offering a lower efficiency 80Kw as well as the higher efficiency 30Kw unit. It will be fascinating to see what is eventually offered for real? An aero-derivative APU style unit perhaps? Frustrated at the lack of real progress in the turbine car world? Well why not do it yourself? A California based engineer did just that! 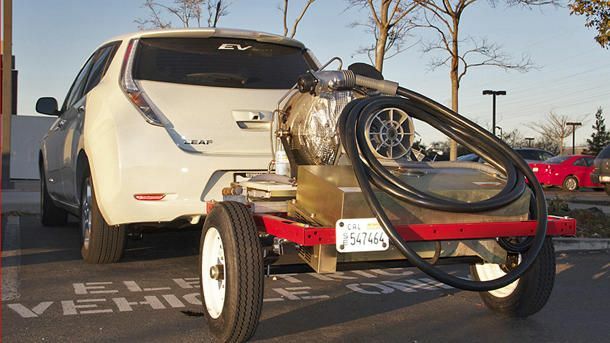 A Capstone C30 is towed behind a conventional electric car and is used to extend the range by recharging the battery when the car is parked. An interesting spectacle to see and hear a microturbine singing away to itself whist left in a Mall car park! This particular installation clearly benefiting from the bone dry blue sky California weather!